Call it Project Mercury, and as of today, call it an EA game. The epic role-playing game that won't — confirmed! 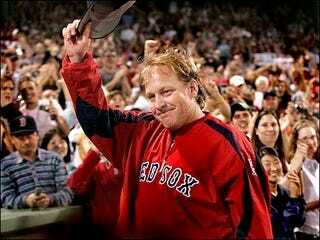 — be called The Adventures of Curt Schilling has a home and a whole lot of mystery around it. Last week, top people involved in Project Mercury briefed Kotaku on the news being made official today that 38 Studios, the game company founded by former Boston Red Sox ace and avid gamer Curt Schilling, has signed a deal with Electronic Arts to have its mysterious, epic role-playing game published by EA's Partners label. That's the same EA Partners program that has brought gamers projects from other non-EA development studios, including The Orange Box from Valve, Rock Band from MTV Games and Brutal Legend from Double Fine Productions. But new details? Few were to be had. As had already been reported, Schilling has partnered with comic book guru Todd McFarlane and best-selling fantasy author R.A. Salvatore to create a universe within which 38 Studios' Big Huge Games is creating a role-playing game. Heading the project at Big Huge Games is Ken Rolston, former lead designer of the Elder Scrolls games. Kotaku joins gamers in wishing we knew anything more about the game. Referencing Rolston's resume, we theorized that this epic role-playing game might be similar to an Elder Scrolls IV: Oblivion. But 38 Studios CEO Jen MacLean said that supposing that "would do a disservice to Todd and R.A.'s involvement." Those two men and Schilling, she said, have envisioned a novel fantasy world. We may be in the dark, but EA Partners dealmaker David DeMartini told Kotaku that two very good role-playing game experts, EA's own leaders of its RPG powerhouse studio Bioware, Ray Muzyka and Greg Zeschuk, were involved in vetting 38's game. "I would be a fool if I didn't tap into one of the best RPG developers in the world with Ray and Greg," he said. "They were involved in the collaboration and discussion of the project." Schilling and company's game will be released for the Xbox 360, PlayStation 3 and PC. No release timeframe was specified. The game won't be called Project Mercury when it comes out, and, as noted above, it won't be called The Adventures of Curt Schilling either. We threw that one out there. We asked. No chance.